Emerging social business intelligence tools are making it easier than ever before to identify and target online influencers in any market space. I have been working with one such tool, Little Bird, over the past several weeks to shed some light on the key online influencers in the financial services space. In this article, I will share some observations about the data set that I generated using Little Bird and how this information can be used in sophisticated social networking, outreach and engagement efforts. Who are the leading influencers in financial services? Below I have embedded a Google Docs spreadsheet summarizing the top 250 influencers in financial services. This data set was produced by creating a report on Little Bird for the key word “finserv”, then exporting the data and formatting it for this article. * The report was created in February 2014. This data set is available here as a public Google Docs spreadsheet. * Note: Emerging insiders ranking is based on “Emergence score” as calculated by Little Bird. Scores displayed above should be multiplied by 10-9 to obtain actual scores as calculated by Little Bird. How does Little Bird work? Little Bird uses peer-validation to rank people around topics or keywords. So, rather than tracking merely the quantitative data (numbers of followers, friends, retweets, etc. ), Little Bird is looking for connections and patterns within the data that signify qualitative relationships. The Insider Score is a simple count of the number of followers any other insider has from within the keyword-defined influencer group. This seems like a good place to start measuring influence: the people or companies with more followers from the influence group, it stands to reason, have achieved a level of greater awareness among those influencers. The Listening Score is a measure of how many of the keyword-defined influencer group are being followed by an insider. The greater the number of insiders being followed, the more “tuned in” an insider could be said to be. How accurate is Little Bird in identifying financial services insiders? In less than 5 minutes, Little Bird had produced a list of 619 insiders for the keyword “finserv”. As a matter of comparison, over the past three years I have been compiling a Twitter list of finserv influencers through empirical observation and engagement. This was done mostly organically; I would become aware of a person that I felt was making valuable contributions to the discussion of social media in financial services and I would engage them and then add them to the list. Virtually all of the individuals on my painstakingly compiled list over the past few years are in the Little Bird data set. Note that any number of reports can be run for any keywords, so if you wanted a more comprehensive review you might try a number of different related keywords. The possibilities associated with having this kind of market intelligence at your fingertips are endless. Perhaps you are working in the financial services space and you want to increase your profile as a thought leader. Maybe you’re an entrepreneur and you want to reach out to the influencers in the space – and become one. Or perhaps you’re a service provider trying to build awareness around your offering and add value to topical online discussions. It used to be, only a few years ago, that identifying a strategically valuable network of people was a bonafide research project. In fact, consultants like me used to charge for this kind of “who’s who” research because it was valuable knowledge to have. Now, it’s a report that can be run in less than 5 minutes. However, you can’t just compile these Twitter handles and email addresses and start blasting them with your marketing pitches. Well, you could try that, but that’s not likely to attract much of the positive attention you want. 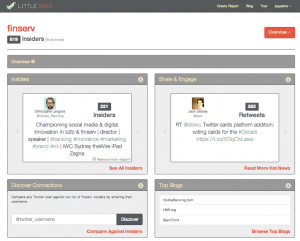 Follow more (or all) of the insiders on Twitter and look for opportunities to interact with them. Connect with these insiders on other social networking platforms (LinkedIn, Google+, etc.) that are identified in the data set and broaden your points of connection. Read insiders’ blog posts, then comment and share them. Determine which blogs/publication sites garner the most share of the discussion and focus attention there, perhaps guest posting or authoring a column. Many of these activities are facilitated by the Little Bird interface: you can easily identify insiders you don’t follow yet and insiders that don’t follow you. Also, there is a nice summary of all insider blogs that can be exported as an RSS feed to be viewed in your reader of choice. You can have Little Bird prompt you to take these actions with a daily email notifications – or just jump in and start building your strategic relationships. I have been really impressed with Little Bird and the accuracy and value of the social networking intelligence it can deliver. If your business objectives include engaging with a community of influencers, building thought leadership, and/or developing a long term personal or corporate brand strategy, then Little Bird may be your golden goose. Wondering what an intelligent social networking strategy would look like for your business? Send me an email or share your feedback in the comments below. Previous ArticleWhat you learned about social networking back in grade schoolNext ArticleWhat is a peer-validated community of interest and why would you want to build your stature within one? That’s pretty cool Jay. Seems I should be combining my two Twitter handles! Unfortunately there is no way to do that. However, I think there is some value to keeping the brand separate from me :). I think you have good reason to have two handles – and they’re both in the top 100! Over time, I think you will get greater value from the two brand identities. This is a great resource, Jay. Thanks for compiling. One thing I’ve noticed about #finserv is that it’s a (relatively) lightly used hashtag. Any ideas on what we could do promote its steady and consistent use? With regards to the Top 5 insiders, quality is a ignored: I seriously don’t understand why Christophe Langlois is No1 & Brett King is No5. The explanation for the ranking is in the data: Christophe Langlois is followed by more insiders. Does that make him more influential? Not necessarily. There are a variety of other metrics by which you can sort the data and find other leaders. I think the point here is not to focus too much on who is top in any given category, but to see the data set of 250 influencers as a valuable tool. Hi Jay, Great List and great article concept. Thank you for including me. Appreciate the feedback, Bart. But YOU included yourself. Whatever you’re doing online has managed to position you as an “insider” according to the #finserv keyword. Keep up the good work.